Voki tips, tricks, and workarounds for you to use! It’s a book report with a twist! Writing a book report can be boring so have your students submit a book report using Voki. They can work on their writing skills AND presentation skills! Improve your students’ creative writing skills with this fun activity. Have your students tell their favorite Aesop’s Fable with a Voki. Or, you can have them write their own fable! Get your students involved in class with a news report. Students can create a weekly class news report. Have each student take turns each week to create the news report! There are a lot of fun and creative activities using Voki. If you have one, feel free to let us know! 3. Select your Voki size. 4. Click to copy your Voki embed code. 5. Go into your Canvas account and find your course. 8. 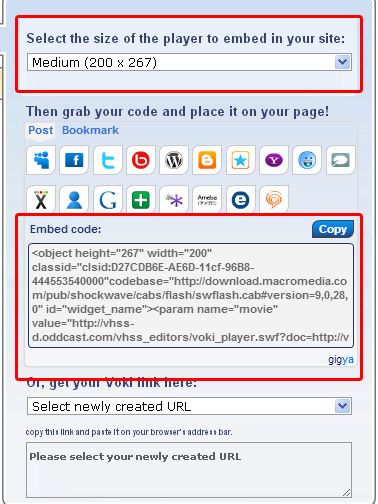 Paste Voki Embed code into the editor. 9. Add “s” after all http. 10. Save or publish your assignment. 11. Your Voki will be added to your Canvas Assignment! Easy right? Have fun and enjoy! Students can create two Vokis with the vocabulary word that they need to know for the week. Ask them create 2 Vokis: one Voki with just the words (it can be 5 or more!) and one Voki with the words AND their definitions. They can use the Vokis to test and practice for the next quiz! Have questions, comments, or feedback? Send an email to feedback@voki.com! Looking for a fun way to get your students more involved in class? You can ask them to create a weekly class news report as if they are the newsreader. Each child can take turns in being the newsreader. The news report can be about the upcoming class trip or important test, this week’s weather condition, and anything other important class or school news! Want your students to keep a journal for class? 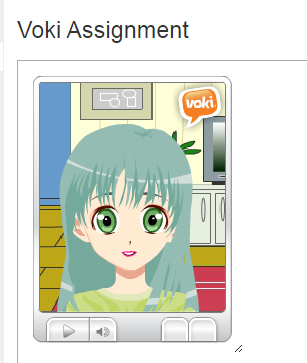 Make it fun by having them create their journals with Voki by recording their own voices. Then you can embed all the characters on your class blog or class site! Encourage them to write about their day, what they learned in class, and what they saw on the way home! Have a question, feedback, or comment for Voki? Send an email to feedback@voki.com! Are you not receiving your activation emails after you signed up for your Voki account? Activation emails are sent immediately after you signed up for an account. Make sure that “notifications@voki.com” is in your safe senders list. This will ensure that you receive the email notification you need. Activation emails may be stuck in your junk/spam box. Double check your junk/spam box to see if your activation email is there. If you are using your school email, your school filter may have blocked your activation email from arriving. So talk to your IT department about allowing Voki emails to go through. Have any questions, comments, or feedback? Email them to feedback@voki.com!